Ngoc Nguyen Ba (GDG Hanoi lead) talks about how trying to speed up the registration process at their Google I/O Extended event spun into creating an event app that is now available on Google Play. Ngoc, what was your journey that lead to you becoming a community organizer? I started GDG Hanoi in 2013 after I learned about the GDG program online. Being inspired by Google I/O, I wanted to bring in-depth tech events to Hanoi. I wanted to contribute to my local ecosystem in a meaningful way by sharing my knowledge (which I enjoy a lot) and also learn something new along the way. You mentioned wanting to ‘contribute to your local community.’ What are some ways you’re achieving this? Besides events, we host regular training workshops (with focus on Android and more recently ML and deep learning). As we see a growing interest in topics around ML, I published my “Essential Knowledge for learning Machine Learning in two months” guide on GitHub that currently has over 500 stars. How many members do you currently have in GDG Hanoi? Through our social media (FB, Meetup.com), we can reach up to 16K developers. These numbers didn’t happen overnight for sure and reflect our growth over the last 5 years. How many people are running the chapter? I like to stick to the ‘scrum rules’ and keep the organizer team under 10 people but not less than 5. We have team members responsible for Social Media, Marketing, Design (they design all the visuals and swag for our big events) and Logistics. We try to switch the roles around so people can try something new if they’re interested. Building a team around you is key, otherwise you get exhausted with the workload quickly. Having automatization tools also helps to save time. We use a mass mailing service for email communication. For task management, we use Trello and store everything on Google Drive. If we need to talk to each other, we have a dedicated Slack channel. Building a community is not an easy task, you need to make both the members and the organizers engaged. It’s an ongoing challenge: trying to be better with every event that we organize. I see. What about regular meetups, how often do you host them? Besides large Devfest and I/O Extended events, we run several smaller scale workshops based on topics people are interested in. We don’t have a regular meetup schedule. How do you decide the topic(s) of your meetups? We send out surveys (using Google Forms) and post on our FB page asking the community about what they would be interested in. We actively approach speakers who are recommended to us or that we see speaking at other events in order to keep quality at a high level. Ngoc, has being a community organizer helped you in your professional career as a developer? Definitely. I need to know what I’m talking about and that means having current information on latest technology. Whenever I learn something new, the best way to test it, is to teach someone else and get feedback along the way. Being an organizer has helped me to become more confident speaking in front of other people as well. Let me ask about what the local developer ecosystem in Vietnam looks like. A lot has changed from 30 years ago when Vietnam was quite underdeveloped. Today, it’s an outsourcing powerhouse in the Asia-Pacific region with a fast growing economy (note 40% of Vietnam’s population is below the age of 25). Many international companies have their offices here, as the labor cost is still quite low. Vietnam is working hard to grow its skilled labor force to be able to compete with its neighbours Singapore, Malaysia and the Philippines. We still haven’t many product companies located here and the local startup scene is just beginning to grow. One example of a local developer ecosystem product you might be familiar with is the mobile game “Flappy bird,” developed by Vietnamese video game artist and programmer Dong Nguyen. Interesting. I know that you and your team recently created an app featured on Google Play. Can you tell me more about that? The app was originally created to help us with the registration process for Google I/O 2018 Extended. We had 1.3K attendees and wanted them to check in within 2-3 seconds using a QR code. One of the other features that we added is event personalizing, like the ability to add favourite topics/speakers and get notifications based on preferences. Knowing what our audience prefers before the event itself helped us allocate bigger breakout rooms for the most popular topics. That sounds very practical. Are you planning to add any other features to the app? We’re planning to extend the app to include other events, not just the Google I/O Extended, and enable users to confirm event attendance directly from the app. I’ve been talking to GDG organizers from other chapters who would also like to use the app for their events. They mentioned other features like enabling live streaming directly from the app, real time notifications during an event etc., so there are a lot of ideas, we’ll see where this leads us. Ngoc, what achievements in your community are you most proud of? I am really proud of Google I/O Extended 2016. That was the biggest event that we have hosted so far with over 1.8K attendees. I am also happy about the app doing well in the Google Play store and seeing how other content we create gets well received by our community. 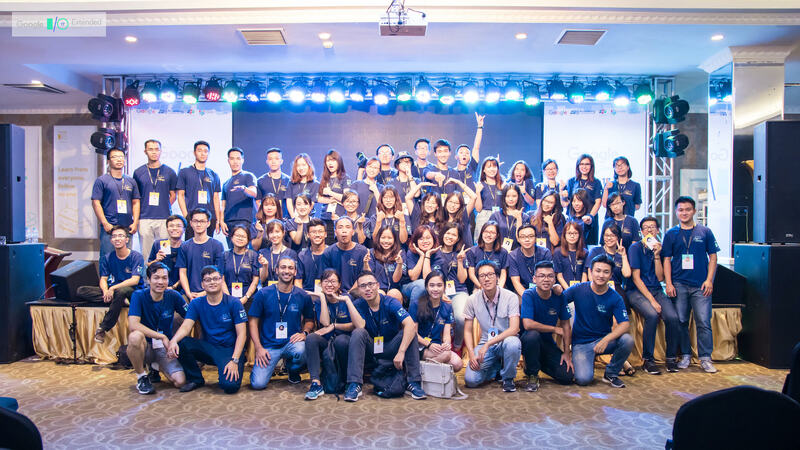 However, I’m most proud of the GDG Hanoi organizer team. We all put a lot of energy in community work and we’re achieving what we set out to do.